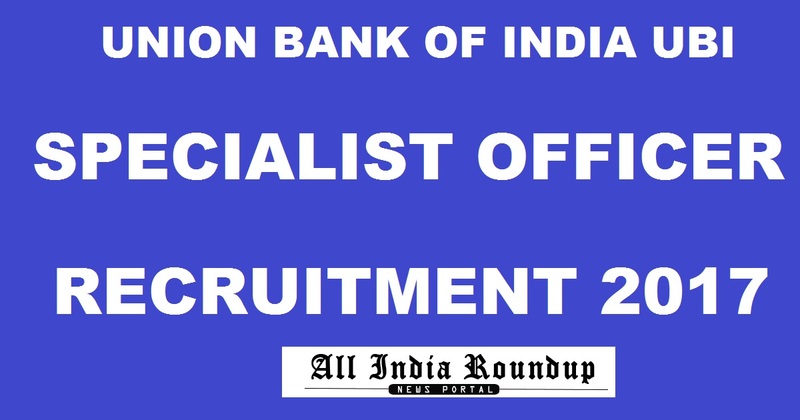 Union Bank of India (UBI) has released notification for the recruitment of candidates as Specialist officers. There are about 100 vacant positions for which the notification is released. Candidates who are looking for the bank jobs can check the eligibility criteria, important dates and other required details from the article. Aspirants can check Union Bank of India SO notification and apply online from the direct link provided below. Union Bank of India is one of the largest government-owned banks of India (the government owns 63.44% of its share capital). It has representative offices in Abu Dhabi, United Arab Emirates, Beijing, Peoples Republic of China, London and Shanghai, and branches in Hong Kong, Dubai (Dubai International Financial Centre),Antwerp in Belgium and Sydney in Australia.The bank had 4196 branches in India as on 31 March 2016 and to add to it 4 overseas branches. Shri Arun Jaitley, Honorable Minister for Finance, Government of India on 30 March 2016 inaugurated the Sydney branch. This year it has released notification for the Specialist Officer posts. Candidates should check the eligibility criteria like educational qualification, age limit, application fee, selection process, exam centers. Etc. If candidates meet the eligibility criteria they can proceed further to apply online. Candidates who are applying this post must have Graduation or Post Graduation degree with a specialization in Finance/ Mathematics/ Statistics/ Commerce from a recognized university or Institute. Candidates should have a minimum age of 23 years and a maximum of 35 years. Other age relaxation details can be seen in the official notification. The online examination will be held at five centers all over India at Bengaluru, Delhi, Kolkata, Lucknow, and Mumbai. Examination will be conducted on 9th February 2018. Candidates who belong to the general category should have to pay Rs. 600/- and SC/ST candidates should have to pay Rs. 100/- towards the application fee. How to Apply For UBI SO Recruitment 2017? 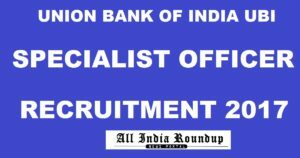 Click on UBI SO Recruitment 2017. Fill all the details correctly on the provided fields. Stay tuned to this website for more details regarding the Union Bank of India Recruitment 2017. Press CTRL+D to bookmark this page for more exciting updates from this page.